We are in Sydney! It was a long day. We got up early and hit the road from Fox Glacier to Queenstown for our flight yesterday. Oy. We were all really glad to get here. The best part is we don’t have to up pack and re pack for 5 whole days. This vacation has been great, don’t get me wrong, but it is nice to be able to settle down in the same place for a few days. Today we get ourselves oriented and figured out the transportation system. You would think that a New Yorker would be able to figure out the public transportation system in any city, but it is crazy here. 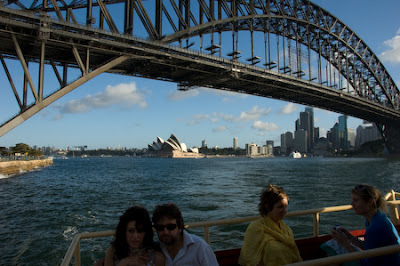 They have ferries, subways (double deckers! ), light rail trains, a monorail and buses. To make it extra complicated, you have to have two separate cards to use all the different types of transportation. The ferry this evening was fabulous. We went right past the Opera House and the Harbor Bridge, unfortunately another ferry was in the way for all the good pictures of the Opera House. Luckily we can take as many ferries as we want for the next 4 days.